Osteopathy is an internationally recognized manual medicine that focuses on total body health. Its main emphasis lays on the structural and functional integrity of the musculoskeletal system. It positively affects all the systems of the body. It uses a variety of hands-on physical treatments that are usually employed along with exercise, occupational and dietary advice in order to help the person recover from injury and pain. Osteopathy is also widely used for wellness. Chiromassage is a style of massage therapy specifically used to relieve painful conditions that affect the soft tissues of the body. It involves specific techniques to improve muscle and joint function. The goal of Chiromassage is to help the body to have an adequate balance while being an overall rewarding experience. Juan is certified in Osteopathy, Chiromassage and Sports Massage. He has over 10 years of experience as a manual therapist, which he combines with his experience as a certified Personal Trainer and Therapeutic Exercise Specialist. He has a gentle and caring approach. drawing upon natural forces to optimize and balance energy within) through the attainment of deeply focused and relaxed states. Qigong therapy can promote circulation, physical function and relieve chronic pain. Pang work as motion therapist. He is certified in Thai traditional massage, foot reflexology and sports massage. And he’s also Yoga and Qigong practitioner. He integrates the science of mind & body and applied in his qigong therapy program. He taught Qigong therapy to promote movement and pain relief to an elder at the Thais Health organization. Restorative Yin yoga helps to stretch and relax the connective tissues around the muscles and open up the joints, focusing on pelvis, hips and spine. It helps to improve flexibility, calm the mind and reduce stress. It also can be a beneficial complement to a dynamic Vinyasa practice to create a balance for the mind, body and energy. Chiharu uses meditative approach combining calming Yin yoga and energy work based on Reiki, which is Japanese healing technique utilizing life force energy. Chiharu studied with Sarah Powers, Sebastian and Murielle, and is a qualified Reiki and ThetaHealing practitioner. Adrian has a keen eye and understanding of bodies, states of being, and language. Private sessions with Adrian are personalized according to what is important to you- whether that is achieving more advanced posture, deepening your knowledge of yoga, or therapy for improving alignment, weight loss, or managing pain. 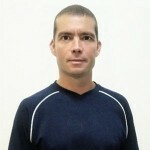 Adrian Cox (E-RYT) is the founder and director of Yoga Elements. He has been teaching yoga since 1999 and practicing yoga for 25 years. Adrian is a licensed trainer of Neuro-Linguistic Programming (NLP) and Hypnosis and teaches yoga workshops and trainings throughout the world. Tonia’s private classes are energetic, informative and keeps a strong emphasis on breath and essential alignment principles to prevent injuries. She has a sound knowledge of anatomy as it relates to asana and keeps a keen eye on movement patterns and energy flow in asana practice, adapting and modifying where necessary to cater for individual needs. Being a mother of 2, Tonia understands and relates well to expectant mothers and in her pre-natal classes, she works closely together with to-be moms to prepare them for the arrival of their babies. Tonia Cheng (E-RYT and RPYT) has been practicing yoga since 2004, is a certified Yoga Elements teacher, with 10 years and more than 3500 hours of teaching experience behind her. Tonia has a dedicated daily Ashtanga practice and travels annually to study in Mysore. Hayeon Song is a certified pre and post natal yoga teacher through JAI YOGA SEOUL 2013, a certified Yoga Elements teacher 2015 (RYT 200 Yoga Alliance) and a certified Yin Yoga Teacher through Sebastian Pucelle, WITH-YIN YOGA 2017. Fook’s class is a mindfulness-based vinyasa and yin yoga practice. Her classes are gentle and well-balanced with emphasis on breathing and finding ease in the postures. She believes that yoga is a tool for restoring and improving health as well as providing a means of self-discovery and healing. She integrates her skills in yoga practice and Vipassana meditation to help deepen and encourage a strong internal body, mind and spirit awareness to the students. Fook is a certified Yoga Elements Teacher (RYT 200 Yoga Alliance) and Yin Yoga Teacher. Her experience and learning have been positive influences in her life and she takes great pleasure in sharing her discovery with others. Pong offers detailed, emphasizes safety alignments and variations to support different student levels, at the same time allows students to explore and expand their own body and mind with awareness. Pong’s yoga journey started in 2002 at Yoga Elements Studio. She continues to deepen her yoga with various teachers through her years of practice. She completed and certified Yoga Elements Teacher Training (RYT 200 Yoga Alliance) as she began to feel the transformation yoga had in her life, she got inspired to share the experiences she has had with others. Eunha’s class aims to get clear self-awareness while building both strength and flexibility. She leads a student to feel body and mind with a conscious breathing. It’s time to meet a creative and easy way to approach advanced asanas while keeping essential alignments to prevent injuries. Eunha fulfilled Vinyasa and pre-natal teacher training course in Bangkok and is registered for Yoga Alliance RYT-200 and RPYT. Her boundary of yoga experience expands to Vinyasa, Ashtanga, Iyengar, and Hatha since 2005.